Honey is the most important primary product of beekeeping both from a quantitative and an economic point of view. It was also the first bee product used by humankind in ancient times. The history of the use of honey is parallel to the history of man and in virtually every culture evidence can be found of its use as a food source and as a symbol employed in religious, magic and therapeutic ceremonies (Cartland, 1970; Crane, 1980; Zwaeneprel, 1984) an appreciation and reverence it owes among other reasons to its unique position until very recently, as the only concentrated form of sugar available to man in most parts of the world. The same cultural richness has produced an equally colourful variety of uses of honey in other products (see Figure 2.1). Honey in this bulletin, will refer to the honey produced by Apis mellifera unless otherwise specified. There are other honeybee species which make honey, and other bees and even wasps which store different kinds of honeys as their food reserves. More details on honey from other bees are given in section 2.11. Freshly extracted honey is a viscous liquid. Its viscosity depends on a large variety of substances and therefore varies with its composition and particularly with its water content (Table 2.1 and 2.2). Viscosity is an important technical parameter during honey processing, because it reduces honey flow during extraction, pumping, settling, filtration, mixing and bottling. Raising the temperature of honey lowers its viscosity (Table 2.3) a phenomenon widely exploited during industrial honey processing. Some honeys, however, show different characteristics in regard to viscosity: Heather (Calluna vulgaris) Manuka (Leptospermum scoparium) and Carvia callosa are described as thixotrophic which means they are gel-like (extremely viscous) when standing still and turn liquid when agitated or stirred. By contrast a number of Eucalyptus honeys show the opposite characteristics. Their viscosity increases with agitation. and therefore the composition of the honey (Munro, 1943). its water content (Munro, 1943). Viscosity of sweet clover honey containing 16.1% water according to temperature (Munro, 1943). Sugars account for 95 to 99% of honey dry matter. The majority of these are the simple sugars fructose and glucose which represent 85-95% of total sugars. Generally, fructose is more abundant than glucose (see Table 2.6). This predominance of simple sugars and particularly the high percentage of fructose are responsible for most of the physical and nutritional characteristics of honey. Small quantities of other sugars are also present, such as disaccharides (sucrose, maltose and isomaltose) and a few trisaccharides and oligosaccharides. Though quantitatively of minor importance, their presence can provide information about adulteration and the botanical origin of the honey. Water is quantitatively the second most important component of honey. Its content is critical, since it affects the storage of honey. Only honeys with less than 18% water can be stored with little to no risk of fermentation. The final water content depends on a number of environmental factors during production such as weather and humidity inside the hive, but also on nectar conditions and treatment of honey during extraction and storage. It can be reduced before or after extraction by special techniques (see 2.6.9). Among the minor constituents organic acids are the most important and of these gluconic acid, which is a by-product of enzymatic digestion of glucose, predominates. The organic acids are responsible for the acidity of honey and contribute largely to its characteristic taste. Minerals are present in very small quantities, potassium being the most abundant. Dark honeys, particularly honeydew honeys are the richest in minerals. Even though some of the substances responsible for honey colour and flavour have been identified (see Table 2.7) the majority are still unknown. It is more than likely that honeys from different botanical origins contain different aromatic and other substances which contribute to the specific colours and flavours and thus allow to distinguish one honey from another. Similarly, it is very likely that, depending on their botanical origin, honeys contain traces of pharmacologically active substances. Some of them have been identified, such as those responsible for the toxicity of certain honeys (see also section 2.9), but for the majority of possible substances, scientific verification requires further studies. Honey is most commonly consumed in its unprocessed state, i.e. liquid, crystallized or in the comb. In these forms it is taken as medicine, eaten as food or incorporated as an ingredient in various food recipes. However, honey is considered a food only in a few societies such as those of the industrialized countries in Europe and North America, Latin America, North Africa, the Near East and increasingly in Japan. In most parts of Africa it is used for brewing honey beer and to a much lesser degree, as medicine. In most of Asia it is generally regarded as a medicine or at most an occasional sweet. High per capita consumption in industrialized nations (see 2.10) does not reflect the consumption of unprocessed honey per person but includes a very large quantity of honey used in industrial food production, i.e. as a food ingredient. In order to increase consumption and to make the various honeys more attractive, a large variety of packaging and semi-processed and pure honey products are marketed. Though they are strictly still "only" honey, their form of presentation can add a certain value to the primary product and is therefore briefly discussed here. One of the more appreciated forms, price wise at least, of selling natural honey seems to be honey in its natural comb. Including pieces of comb honey in jars with liquid honey (chunk honey) is very attractive to many consumers and appears to disperse suspicions of adulteration. Creamed honey (soft, finely crystallized honey) is a very pleasant product which is convenient in use because it does not drip. Honey is sometimes "enhanced" by adding pollen, propolis and/or royal jelly without changing the state of the honey itself. 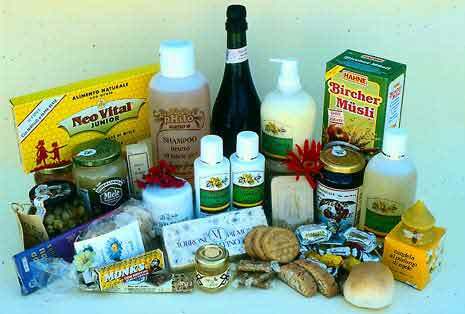 These products are described in the pollen, propolis and royal jelly chapters. For other "improvements" in the form and size of packaging see section 2.6.11. In some countries the appearance of the marketed honey is not very important, i.e. it may be liquid, crystallized or semi-crystallized and with or without wax particles etc. Therefore it can be bottled as it is. In other countries, consumers want not only clean honey but also prefer liquid honey. Consumer education may change this attitude, particularly where it is based on the widespread but false belief that honey crystallizes because it is adulterated with sugar. To remain liquid however, many honeys require special processing (see 2.12.1). Slow crystallizing honeys can be sold without further processing or may be used, if lightly coloured, to pour around bottled chunks of comb honey or fruits and nuts. 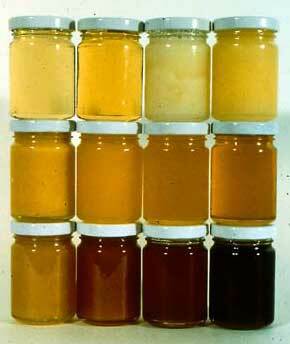 Light coloured honeys are particularly suitable for sale as comb honey in special clear packages (see Figure 2.16 a). But any kind of honey can be sold as comb honey as long as the combs are evenly sealed and relatively new, i.e. with white or light yellow wax. 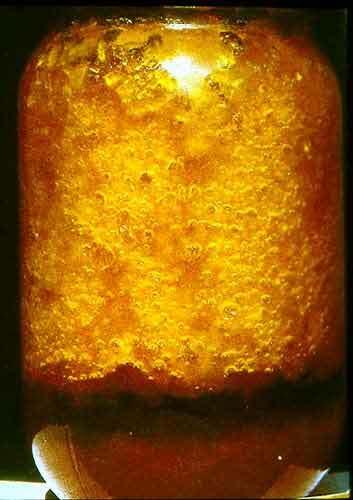 In blending different honeys, attention has to be paid to the final ratio of glucose to fructose and the possible need for additional heat treatments Fast and slow crystallizing honeys low in moisture content can be processed to prolong their liquid state (see section 2.12.1) or can be forced to crystallize under controlled conditions to achieve a soft and uniform consistency (see section 2.12.2). The traditional use of honey in food preparations has been substituted in most cases by sugar and more recently by various sugar syrups derived from starches. These exhibit similar composition and characteristics, but at a much reduced cost. At the same time, as part of the increasing appreciation of more natural products in many countries, honey has been "rediscovered" as a valuable food and therefore confers, also as an ingredient, an enhanced market value to the end product. Many honey containing industrial products which were developed in the last decades, but which did not have the expected success, are currently being remarketed more successfully. Outside of the thousands of "home-made" recipes in each cultural tradition, honey is largely used on a small scale as well as at an industrial level in baked products, confectionary, candy, marmalades, jams, spreads, breakfast cereals, beverages, milk products and many preserved products. In particular, the relatively new industry of "natural", health and biological products uses honey abundantly as the sweetener of first choice, together with non-refined sugars in substitution of refined sucrose (cane and beet sugar). In fact, honey can substitute all or part of the normal sugar in most products (see 2.12.11). Limitations are presented on one side by costs and handling characteristics and on the other by the natural variations in honey characteristics which change the end product, make it more variable and require more frequent adjustments in the industrial formulations (recipes). Recipe books for home use of honey have been published in many languages. Many of these recipes can also be adapted for artisanal and small scale production. Aside from the occasional information in special trade books or journals, information or recipes about large-scale uses of honey are difficult to find. One French text on industrial food production with honey is a good source (Paillon, 1960). Otherwise the National Honey Board of the USA (see Annex 2) is able to provide information and technical assistance including tips on promotion and marketing, to small and large industrial users of honey. To baked products, aside from the already mentioned consumer appeal, honey confers several other advantages such as a particular soft, spongy (springy) consistency which persists longer. Products that contain honey also dry out more slowly and have a lesser tendency to crack. These properties are due to the hygroscopicity of honey, a trait honey has in common with other sweeteners high in fructose, like acid-hydrolysed corn syrup or other syrups made from starches and fruit juices. Another advantage consists of more uniform baking with a more evenly browned crust at lower temperatures. These characteristics too, are mostly due to the fructose content. 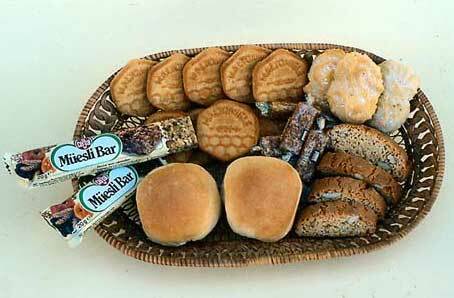 Yet another advantage is an improved aroma, conferred by relatively small percentages of honey (up to 6% by weight of the flour) in sweet cakes, biscuits, breads and similar products (see Figure 2.4). Since most beneficial effects can be obtained with relatively small quantities, the baking industry prefers strong flavoured honeys thus maximizing flavour for the lowest possible cost. On the other hand not more than one third of the sugar in a baking recipe should normally be replaced by honey. In confectionerv production, honey is still included in many traditional products which are consumed locally in considerable quantities but are also exported, such as torrone from Italy, tur6n from Spain, nougat from France and halvah from Turkey and Greece. For the production of caramels (bonbons) honey is used only in very small quantities, since its hygroscopicity presents a major disadvantage: it reduces the preservation time and softens the caramels at the surface causing them to stick together. Some caramels, made with special machinery have a liquid honey core. In gelatinous or gum products, honey can be used in the same way as other flavouring agents (aromas or fruit pulp). The chocolate industry uses honey in only a few products. One Swiss chocolate in particular, in which honey is included in the form of broken nougat, can be found worldwide. In the breakfast cereal industry, honey is used either in its liquid or in its dried and pulverized form, both for better flavour and increased consumer appeal. It can be mixed with cereal flakes and dried fruits or applied as a component of the sweetening and flavouring film which covers the flakes. The dryness or hardness of the cereal can be adjusted with the honey content and the degree of drying. Some cereal recipes are given in Chapter 3. Numerous snack bars (candy bars) are marketed in which honey constitutes the binding and sweetening agent. Other ingredients of the mixtures can be dried fruits (like raisins, figs, apples, apricots, prunes, dates, pineapple, papaya, etc. ), nuts and seeds (like hazelnuts, walnuts, almonds, brazil nuts, pistachios, ground nuts, cashew nuts, sesame seeds, sunflower seeds, linseeds or coconut flakes), cereals of all kinds (rolled, as flakes or in puffed form) and possibly other ingredients such as milk powder, pollen, cacao, carob and aromas. The ingredients are chopped to various sizes and mixed with the hot honey and sugar. Depending on the composition and the degree of heating of the sugars (including honey) a more or less solid product is obtained after cooling. Some can be cooled in moulds, some be cut after cooling and others, which remain soft, have to be layered between wafers or biscuits and coated with chocolate. In any case, all such products are fairly hygroscopic and need to be packed with material impermeable to moisture. A few recipes can be found in Chapter 3 and section 2.12.6. In the wide variety of spreads for bread, there are products in which honey is either the major ingredient, such as "flavoured" honeys, or in which it only substitutes for sugar as in cream spreads and fruit preserves. Flavoured honeys are usually marketed in crystallized form as the addition of the other ingredients speeds up the crystallization anyhow. It is better to control the crystallization and mixing rather than leaving it to chance and having the other ingredients separate from the liquid honey after a short time. The ingredients are either mixed with the honey at the same time as the seed crystals or they are mixed after crystallization has been completed, to obtain a harder or softer end product respectively. For further details see recipes of creamed honey in section 2.12.2. Sun-dried or freeze-dried fruits like raisins, apricots or strawberries may be chopped and nuts and seeds may be pureed and included in the honey, as may be cacao, cream or milk powders and even butter. In some cases the product has to be stored in a refrigerator. Separate attention needs to be devoted to honeys with added aromas or essences, be it fruit or other aromatic essences. Such practices are, or at least have been, more common in Eastern Europe where sometimes the aromas, food colouring or even medicinal drugs were fed to the bees in sugar syrup and the "honey" extracted from these colonies sold as "strawberry honey" or "mint honey", etc. However, they are not truly honey (see definition in section 2.1). To the consumer they present something very similar to natural honeys, at least in appearance. Therefore, European Union (EU) legislation does not allow commercialization of these products under the name of honey. Adding aromas to liquid or creamed honey produced from natural sources is yet a different approach compatible with European legislation, if labelled accordingly, but of questionable consumer appeal. This honey must be labelled so it can be distinguished from unifloral honeys. also showing granola (mijesli) bars. In the preparation of marmalades and jams, honey can replace all or part of the sugars used. The fruit and honey mixture is concentrated by boiling or under vacuum (reduced pressure) until a sugar concentration of at least 63 % is reached, which is sufficient for preservation. The boiling time can be reduced by using partially sun-dried fruits. Any reduction of boiling time or temperature will improve flavour and reduce caramelization. The last two methods, boiling under reduced pressure and using sun-dried fruits, preserve the original flavours better. The use of sun-dried fruit also requires less fuel and 1e~~ expensive equipment (see section 2.12.12). For these types of preserves a refractometer is helpful to determine the final sugar concentration. 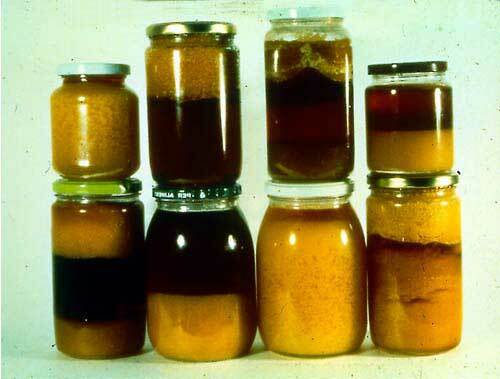 Another alternative is the preparation of "semi-preserves", i.e. those which use less sugar (honey) and boiling (30 minutes), store well in their unopened (sterilized) original containers, but once opened have to be refrigerated or consumed within a few days. The same procedures as under section 8.10.7 can be followed. The quantity and ratio of honey and fruits varies with the fruit and the choice of preserves. Fresh fruits contain between 3 and 20% of sugar and honey contains approximately 80% thus the approximate requirements can be calculated. To obtain a suitable consistency in those preserves with a relatively low sugar content, pectin is added at a rate of 0.1 to 0.2%. Lemon juice or citric and tartaric acid may have to be added to make the mixture sufficiently acidic for the pectin to gel. For home and artisanal use of honey in marmalades, jellies and fruit syrups, there is a multitude of family recipes, but industrial use of honey in preserves remains very limited, probably because of economic considerations. A simple honey jelly made from a mixture of honey, pectin and water is presented in section 2.12.13. In Italy, a product type with whole dried fruits or nuts in honey, or honey with dried fruits and nuts, is quite popular (see Figure 2.5). Clear jars, preferably glass, are partially filled with low moisture, slow crystallizing, light coloured honey and then filled with dried fruits or nuts. If dried fruits with a relatively high water content like pineapple, chestnut, apricots and figs are added, fermentation may occur and the final moisture content of such honeys has to be closely observed or the honey be replaced (see section 2.12.8). 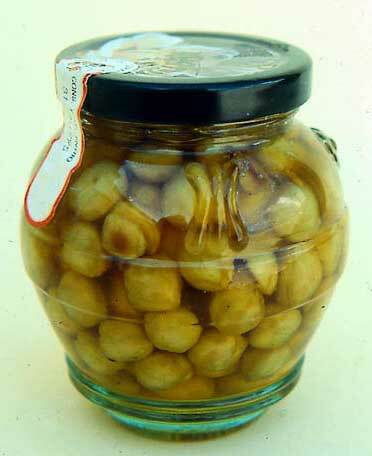 Figure 2.5 : Hazel nuts packed in liquid honey. The use of honey mixed with milk or milk products is a very common home remedy against colds and infections of the throat. In the industrial sector some non-medicinal honey-milk products exist, such as pasteurized and homogenized milk sweetened with honey for long-term storage. One particular honey-milk is prepared with dried milk powder plus 25 % honey and 10% glucose (Spo~ttel, 1950). Another product is yoghurt with honey (Spanish Dairy Corp., 1975). In South America dulce de leche (sweet milk) is almost as essential to the Argentinean diet as meat, and is an extremely popular spread. Though mostly prepared with other sugars, honey makes for a much richer flavour (see section 2.12.7). In yoghurt, honey is used as a sweetener or like other flavourings and is mixed at the rate of 10 to 15 % either before or after fermentation. Alternatively, it may be left separately at the bottom of the container. The mixing causes a slight loss of viscosity of the yoghurt, which can be corrected by adding skimmed milk solids (Brown and Kosikowski, 1970). One of the Italian industry leaders in this sector produces a yoghurt with orange blossom honey, the aroma of which blends very well with the yoghurt. In special combination packages a fruit granola mix is packed above a honey-sweetened yoghurt (Colangelo, 1980). Adding honey to ice creams has been suggested several times, but at least in Italy, ice creams sweetened with honey have never had much commercial success, probably due to the fact that these ice creams melt more easily and at lower temperatures than those made with sugar. This causes problems in distribution and open sales presentations together with other sugar-based ice creams. In other countries, but particularly when ice cream is sold in pre-packaged individual portions or larger 0.5 to 2 litre containers, honey-based ice creams are marketed successfully. The addition of more than 7.5 % honey softens the ice cream significantly, due to its lower freezing point. In the industrial non-alcoholic beverage industry, the use of honey is relatively recent and is expanding. The reasons can be found in a wider distribution of "functional" drinks such as health orientated, strengthening or replenishing isotonic drinks. Honey drinks are most frequently mixed with lemon juice for a pleasant sweet and sour taste, but other fruit flavourings such as apple juice are often added. In 1990, over 40 new honey drinks were introduced in Japan, of which one (on a honey and lemon juice base) was introduced by the Coca-Cola Bottling Co. of Tokyo (PRC, 1990). In many fruit juices too, honey is added as a flavouring and sweetener. In apple juice it is also used to clarify the fresh juice (Lee and Kime, 1984) by adding 4% of a solution containing equal proportions of honey and water (Wakayama and Lee, 1987). Ice tea can be flavoured and clarified with the addition of honey and lemon juice. These new beverages take advantage of a special ultrafiltration process. This filtration through special membranes eliminates any impurities, microscopic granules (pollen) microorganisms and even macromolecules such as proteins, which might otherwise produce turbidity or flocculation in clear beverages. Such ultrafiltered honey loses some of its flavour and colour but gains in consistency, which is highly appreciated by food processors for its lower production cost. This ultrafiltration may soon find wider application not only in the beverage industry, but also in the dairy, cosmetic and pharmaceutical industries (Lagrange, 1991). For inclusion in some recipes, honey is also dried or dehydrated by various industrial techniques (Olstrom, 1983), usually some type of vacuum or spray drying. However, dried honey is even more hygroscopic and needs to be stabilized by mixing with other powders such as starches, flours or other non-hygroscopic sugars, which are compatible with the final recipe. The percentage of stabilizers is in general around 55 % but may vary from 20 to 70% in case of, for example, porous maltitol powder (Ebisu et al., 1988). The powdered honey is used in dry mixes for cakes, breads and drinks or energy health powders and avoids the need to handle any liquid or sticky honey. Other applications are in cosmetics and alcoholic beverages, where additional water content is not desired or where handling of liquids increases production cost. Lupke (1980) discusses the use of dried honey in baked goods in Germany. Yener et al. (1987) describes different production techniques used in Turkey for the stabilized dry honey powder. Crane (1990) reports granular dried honey as reducing shrinkage of meat products by 19% and production of an additive-free dried honey powder has been mentioned in the Speedy Bee (1988). Honey is also used in the manufacturing of sauces, the preparation of canned meat and honey cured (cooked) hams. Distilled alcoholic beverages incorporate honey as a flavouring agent after distillation, as for example Benedictine in France, Drambuie in Scotland, Irish Mist in Ireland, Grappa al Miele in Italy, Krupnik in Poland, Barenfang in Germany and many others. For all the mentioned preparations, most of all for those with a high honey content, the quality and flavour of that honey are important. Any recipe will have to be adapted to the type of honey available and most of all to its water content, which determines the cooking or baking times in pastries and preserves, and the appearance, consistency and stability of other products. The medicinal use of honey is probably its most widely known use, but such uses do not require special preparations. If not used straight, it is mixed at home with other liquids such as hot milk, teas or other infusions, wine and other alcoholic beverages. The pharmacopoeias of many countries describe a honey-based preparation which can be prepared by pharmacists (honey rose water) which is used for topical application in infected throats and various ulcers of the mouth (see 2.12.15). More common is the use of honey in herbal and other traditional extracts. If the extract is presented in the form of a syrup, the preparations need to be sterilized with heat before or after the addition of the active ingredients, or a preservative like potassium sorbate or alcohol needs to be added. Sometimes fermented honey syrups are used as a base. These fermented syrups are made by adding yeasts to a mix that contains a much higher ratio of sugar to water (1:1) than is used for honey wines, mead or beer (see next section). Plant extracts are added after fermentation and clarification. The addition of honey to herbal extracts and also prior to fermentation (as described above) is commonly practised in ayurvedic medicine as mentioned in 2.4.1. Traditional African medicinal extracts are also mixed with honey and probably not only because they are easier to take that way. In Europe, many traditional formulations are also known and some were even recommended by Hippocrates (Adams, 1939). Honey is also a fundamental ingredient in some medicinal wines and vinegars. In one case herbs are crushed and immersed for 10 to 30 days in the wine, to which some alcohol may be added in order to improve the extraction and preservation. The liquid obtained needs to be filtered and pasteurized; honey is then added.